Home All News Movie News Will Lakers trade mean more LeBron James on the big screen? 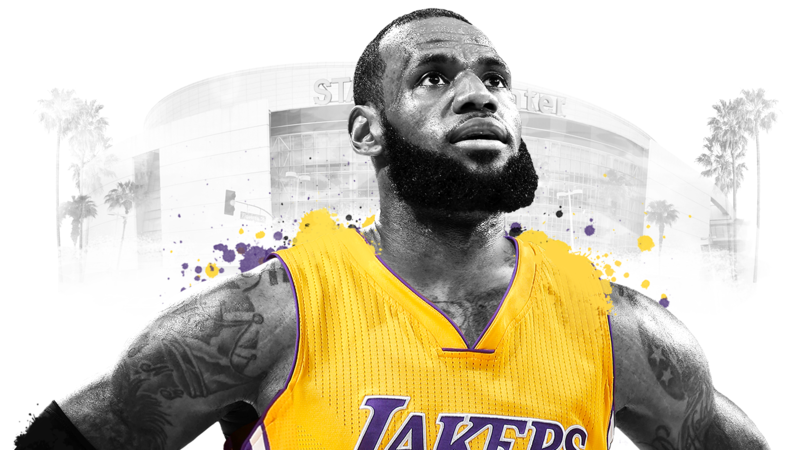 Will Lakers trade mean more LeBron James on the big screen? Now that LeBron James has signed a mind-boggling $154 million contract to join the Los Angeles Lakers, will we see him back on the big screen? Many think this was a strategic career move for the NBA legend to kickstart film projects in the works. So could LeBron fans expect to “Space Jam 2″ coming soon to a theater near you or even a whole new “House Party” franchise? With the leadership of LeBron James, anything is possible. As James comes from Cleveland to Los Angeles looking to take the Lakers to more championships with a blockbuster $154 million contract announced this week, he could also push those two 1990s properties closer to reality and go from part-time presence to major player in Hollywood. James hasn’t yet spoken about his plans for Los Angeles. But if he wants to, he’s already shown he can act, and not just in that good-for-an-athlete way. His one real film role, playing himself in the 2015 Amy Schumer film “Trainwreck,” directed by Judd Apatow, won big raves. Hader said there was frequent improvisation on “Trainwreck,” and LeBron easily kept up with the sketch comedy pros like Hader. “But not cocky,” Hader added. He wouldn’t be the first Laker to try acting. Kareem Abdul-Jabbar and Shaquille O’Neal had their share of famous, and infamous roles. And Kobe Bryant ended up with an unlikely Academy Award for an animated short based on a poem he wrote about basketball. Whether or not he appears on screen, James has already begun a major media career that can only get a boost from LA. Gone are the days when athletes had to be in a major market to make it in film and television, as James himself has shown through his years building his brand in Cleveland. But there’s nothing like face-time for becoming a force in Hollywood. James and his business partner Maverick Carter have a production company, SpringHill Entertainment, that has a deal with Warner Bros. and office space on the legendary movie company’s lot, where he could become a regular. “Certainly the proximity will make it easier for LeBron personally to be part of future projects,” said David Schwab, an executive vice president at Octagon, a global sports and entertainment marketing and management firm. “The advantage of a market like New York, Los Angeles, and Golden State is the ability to have coffee, lunch or dinner daily” with key decision makers. “In a smaller market you don’t get those consistent opportunities,” he said. — “Space Jam 2.” The idea of James reviving the 1996 movie starring another candidate for greatest basketball player of all time, Michael Jordan, has been in circulation for several years. The movie with Jordan battling animated aliens alongside Bugs Bunny and his Warner Bros. cartoon buddies brought mixed reviews and eyerolls at the time, but has become a cult classic. Justin Lin of the “Fast & Furious” films has been attached as director. — “House Party.” Stephen Glover and Jamal Olori of “Atlanta” are writing a script that James and SpringHill hope will revive the franchise that starred Kid n’ Play and spawned three big-screen sequels from 1990 to 1994. — “Smallfoot.” James will have another chance to show off his comic chops as the voice of a skeptical yeti in Warner Bros’ animated film. — “Now We’re Talking.” A digital comedy series on Uninterrupted that features two rival professional football quarterbacks who become broadcasters and frequent pro athlete cameos is about to enter its second season. — SpringHill is also producing several more television projects including the game shows “The Wall” and “Do or Dare” and “Rise Up,” a documentary about the civil rights movement for the History Channel. Previous articleLos Angeles Rams Destined For Memorable 2018/19 NFL Season?